Problem that this facility solves: creating sufficient energy gradient for periodically reversing sediment motion is a challenge in experiments. The major problem is driving the tidal flow as follows. Assuming an experimental tidal system with a depth of 2 cm, the tidal water level amplitude can be at most about 1~cm. Given a typical aspect ratio of the estuary mouth of W/h>100, this means that the width of the experiment should be about 1 m. However, with a minimum slope of 0.01 m/m, the distance from the mouth with sufficient gradient to move sediment is also about 1 m given the maximum water surface amplitude. This, then creates a short tidal basin rather than a long estuary. When the tidal amplitude is enlarged, net export of sediment results so that the tidal system excavates until it is in static equilibrium as probably happened in a number of the experiments of Osborne Reynolds in 1889. 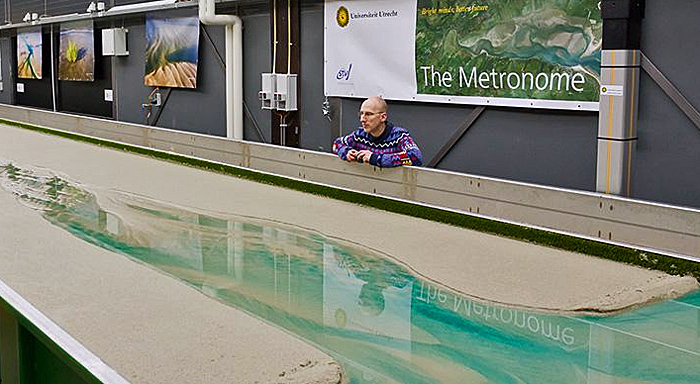 Principle of creating tidal flows: by tilting the entire flume periodically, sufficiently strong reversing flow is driven for sediment transport similarity (see open access paper at https://www.earth-surf-dynam.net/5/731/2017/ for measurements and building plan). With relatively small setups this was shown to result in dynamic tidal systems with channel and shoal patterns that are similar to those in nature (for example http://dx.doi.org/10.1002/2014JF003127). How it is built: the basic components are a steel basin that tilts over the short central axis, motion control, water recirculation, and optical imaging. The steel basin has inner dimensions of 20.00 m long by 3.00 m wide and 0.40 m deep. The flume has two end tanks for water supply, water outflow and for sediment trapping. The end tanks were designed to function as constant head tanks, with sediment traps at the inside of a movable weirs. Small actuators control the motion of the weirs. The large actuators to tilt the flume operate in pairs with motion mirrored at the tilting axis. The actuators keep repeatable positions at all times, also during rest, such that the flume does not deform.